Cortisol is a hormone secreted by the adrenal glands. Cortisol regulates nutrient metabolism. It also helps the body to maintain blood glucose and water balance, and a healthy immune system. Most of the cortisol in the blood remains bound to proteins, and only a small portion remains free and biologically active. The Blood Cortisol Test measures the total amount of cortisol hormone in the blood. 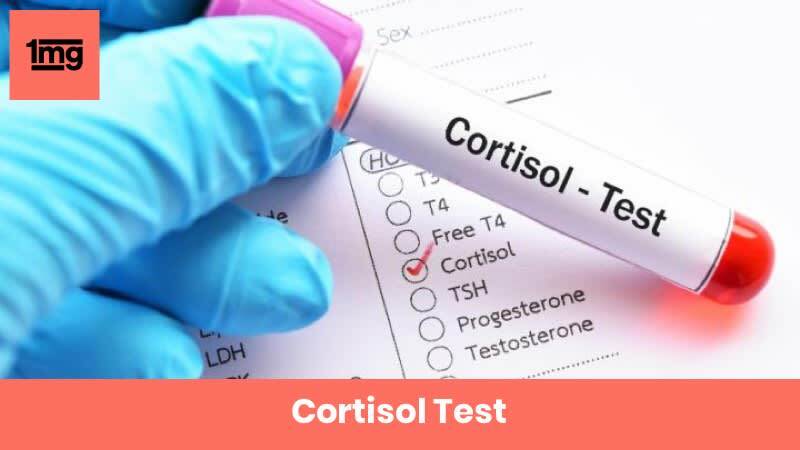 The Cortisol Test measures the total amount of cortisol hormone in the blood. Cortisol is a hormone secreted by the adrenal glands that helps in the metabolism of carbohydrates, fats, and proteins. It also plays a regulatory role in maintaining the blood sugar levels, water balance of the body. Cortisol also helps the body maintain a healthy immune system. Most of the cortisol found in the body is bound to proteins, only a small portion remains free and metabolically active. Level of cortisol hormone rises and falls during the course of a day following a diurnal pattern. Cortisol levels reach highest in the early morning, drop slowly throughout the day reaching its lowest around midnight, and again increases slowly through the night to reach its highest early next morning. This diurnal pattern of cortisol secretion is maintained by the hypothalamus in the brain and the pituitary gland located just below the brain. Fall in the blood cortisol levels stimulates the production of Corticotropin Releasing Hormone (CRH) from the hypothalamus. CRH stimulates the pituitary gland to secrete the Adrenocorticotropic Hormone (ACTH), which in turn stimulates the production of cortisol from the adrenal glands to increase cortisol levels in the blood. Cortisol levels are regulated by a feedback mechanism. When cortisol levels rise to the required levels, CRH secretion from hypothalamus is stopped. This in turn stops ACTH secretion from the pituitary gland, thereby stopping cortisol secretion from the adrenal glands. Symptoms associated with increased or decreased levels of cortisol hormone appear when this feedback mechanism is disturbed due to diseases or lifestyle. Normal cortisol levels may vary among individuals. Increased or decreased cortisol levels can be assessed only if the cortisol level in blood does not follow the diurnal pattern, as it should. Cortisol levels may fall outside the normal range for the time of day due to diseases or due to lifestyle factors such as irregular sleeping times. · Long term treatment with glucocorticosteroid hormones like prednisone, dexamethasone, etc. Q. What factors can affect the cortisol test results? Q. What additional tests can be prescribed by your doctor in case of abnormal result? Q. What is Cushing’s syndrome? Cushing’s syndrome refers to a group of conditions caused due to a sustained increase in the levels of cortisol hormone in the body. Increased levels of cortisol are most commonly caused due to corticosteroid medications used to treat other diseases, but it may also be caused due to overproduction of cortisol from the adrenal glands due to ACTH secreting tumor in the pituitary gland or elsewhere in the body, or adrenal gland diseases like adrenal hyperplasia. Symptoms include fat deposition between the shoulders (buffalo hump), puffy face, purple or pink stretch marks on the abdomen, high blood pressure, loss of bone density, slow wound healing, increased body hair in females, weakness, fatigue, growth impairment, etc. Q. What is Addison’s disease? Addison’s disease, also called primary adrenal insufficiency, is a condition where the adrenal glands do not produce sufficient quantities of cortisol hormone due to damage to the adrenal glands, diseases affecting the adrenal glands, or tumors in the adrenal glands. Symptoms include fatigue and weakness, rapid weight loss, appearance of dark patches of skin, low blood pressure, diarrhea, nausea and vomiting, abdominal pain, etc. Addison’s disease can be life threatening, and can produce severe symptoms suddenly in a condition called addisonian crisis or acute adrenal failure. Q. What are the symptoms associated with increased cortisol levels? Q. What are the symptoms associated with decreased cortisol levels?